Here is a test you can do to feel the restriction in the pelvis. First we must get you to be able to visualize your anatomy a bit so you understand what is under the skin. Visualization is key. 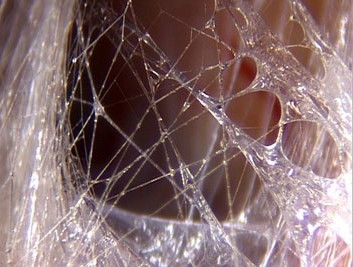 I want you to visualize your whole body as a web of fascia vs individual muscles. The goal here is to find where the web is restricted. To understand fascia please youtube: "Thomas Myers Fascia 101", this 6:59 video will give you an idea of what fascia is. This may take some time to digest! The realization could hit you a week or two later where you truly understand. Some may get it right off the bat but usually it takes some time. ^ Here is a view of the fascia web you just heard Thomas Myers break down in that video. 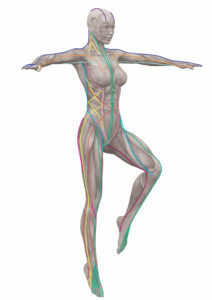 ^ Here is a representation of fascia as you can see a pull in one area affects the surrounding area. ^ Here is how we will visualize this web running through our whole body. ^ The red line going from the bottom side of the foot to the knee to the groin then in through the pelvis to the sacrum is the line we are looking at. Restriction in the pelvis can affect all the way down to the foot possibly, vice versa. Usually it is the restriction in the pelvis that is the one affecting the foot. Now we're going to get specific to the issue at hand, visualize the TRP2 points in your body at the back of the leg right where the adductor magnus area at the back of your leg connects to your ischial tuberosity sit bone. 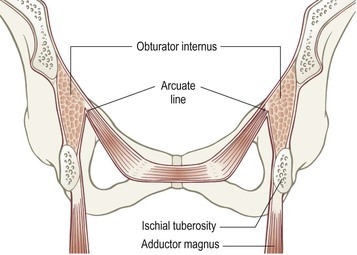 From there you will see it connects to the obturator internus area which will connect to the pelvic floor that is the empty space there to the sacrum. Let me reiterate you see there are these connections by fascia they are not individual so tension in one area of the chain can effect the rest. reveal the rest(pelvic floor and sacrum). 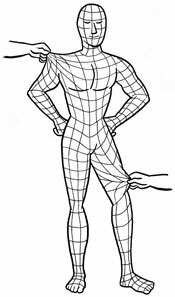 You see i refer to this as "area" and not muscle because we are visualizing the body as a web not individual muscles. You must keep this in mind. You will be able to find where the restrictions are very easy this way as well. I'd recommend you to go through the above about 10 times until you can comfortably understand and visualize the area as a web. Visualization is key! Once you are ready then you can proceed to your test! here is a link, now you do need a soft ball your leg can sink into like in the video. I'm sure you can find such a ball at a shop near you. Also don't do the foot positioning stuff he says just keep your foot sideways comfortable. You can mute the video so there is no confusion. I'm sorry I have not made a video myself I will at some point. So now the purpose of the video is just to show you the position to get in, that's all we need to see. As you can see lying on your side comfortably with the tested leg straight on the ball and the other knee laying in 90 degrees. 2nd step We will strain the area to exhaust it so lift your leg up just a little bit off the ball and hold it. During this time you're continuously keeping your awareness on the area and feeling it out. 3rd step We will release the area as your awareness is still on the sitbone adductor magnus/obturator internus area you slowly bend your knee in towards you at a 45 degree angle while you continue to just really feel the area out. Do this calmly and depending how you feel it's up to you how you proceed from one step to the next. Try to spend some time on each step whatever you feel is comfortable.